Posie Harwood, who finds the best back-of-the-box recipes in the grocery store, shows us why more vanilla is always better. I spent the week baking cake. I wanted to bring you something that you’d get excited about. Maybe it would be a towering layer cake, enrobed in fluffy frosting, or a decadent and fudgy chocolate mocha cake. The baking gods were conspiring against me, however. I pulled flop after flop out of my oven. One was too airy. Another had grainy frosting. One had a slightly rubbery texture, another was tooth-achingly sweet. I was like the Goldilocks of cake, searching for just right. And then I happened upon this double vanilla butter cake. The recipe comes by way of Nielsen-Massey, and if anyone knows how to showcase vanilla, they do. 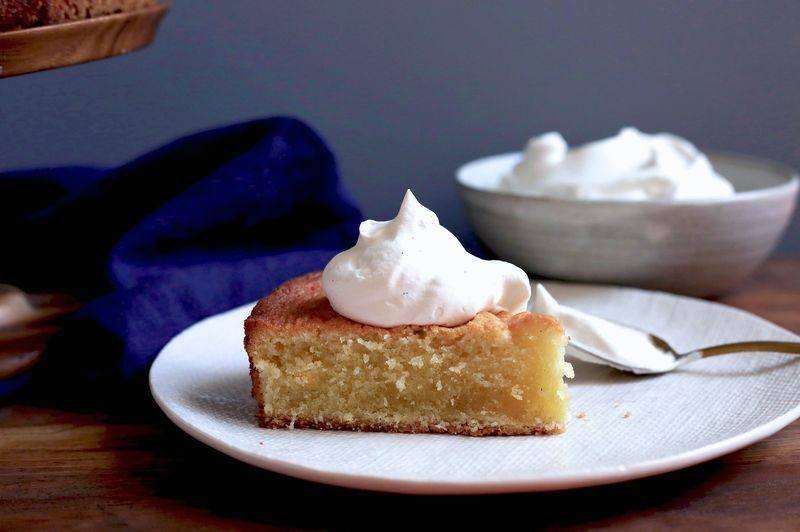 It’s such a simple, lovely cake: the sort you imagine the French have been baking for generations on a weekday morning, because when cake is this good, why wouldn’t you bake it daily? And since the recipe calls for melted butter, it doesn’t even require the foresight of taking your butter out to soften ahead of time. 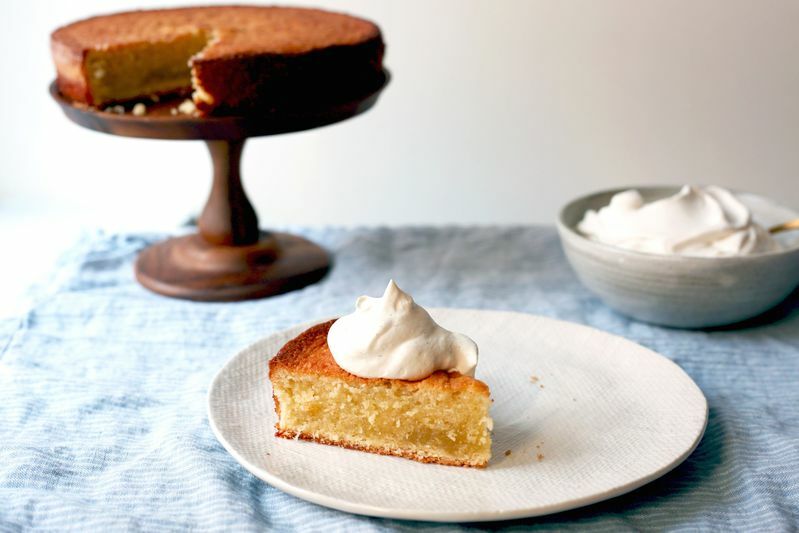 A word about vanilla: This cake is extremely moist and bursting with vanilla flavor. You’ll need two types of vanilla: vanilla extract and vanilla bean paste. Use the finest vanilla you can get your hands on. Its sweet, creamy, distinctive flavor is the high note in this otherwise delicately-flavored cake. Vanilla bean paste (pictured above) is basically the scraped-out interior of a vanilla bean pod added to extract to create a thick, syrupy paste. It’s excellent for recipes where you want those pretty flecks of vanilla (like an ice cream), or where you don’t want the thin liquid of extract diluting your batter. The paste is more concentrated in flavor than extract and gives the batter a gorgeous speckled appearance. 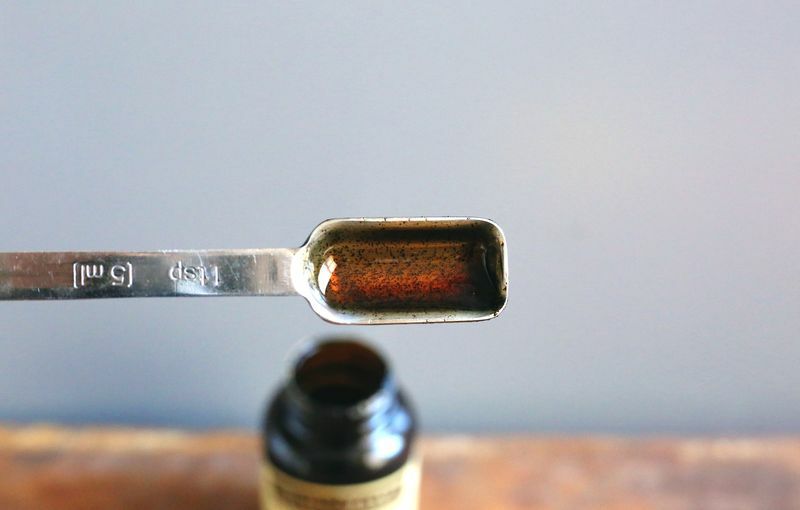 If you can’t find vanilla bean paste, substitute an equal amount of vanilla extract. 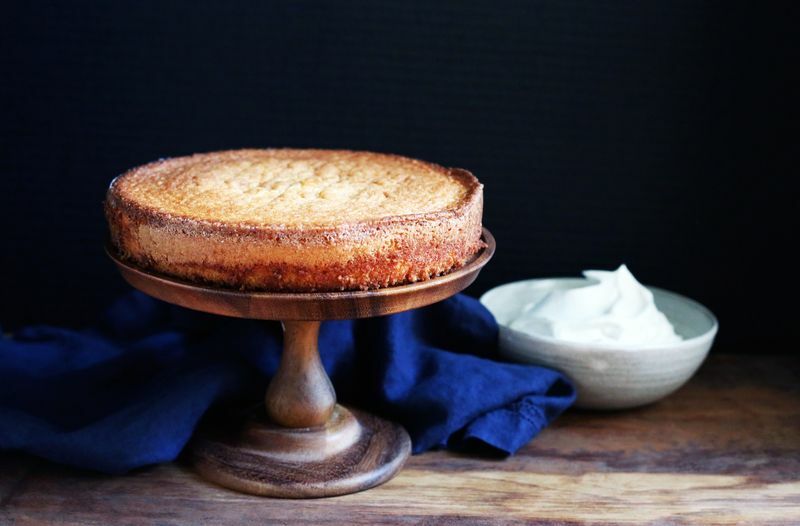 The cake will be fantastic and heavily perfumed with vanilla either way; the vanilla bean paste is simply a way to elevate the flavor profile more. I’ve topped the cake with Chantilly cream—a sweetened whipped cream flavored with even more vanilla—but many toppings would work here. Think of your favorite flavor to pair with vanilla and run with it: lemon curd, sliced fruit, chocolate ganache, vanilla pastry cream, caramel glaze, and so on. I finally made this and it was so good, I made another one the next day. It is truly simple, delicious and sublime. I would recommend a 30 minute cooking time, however; it made it more moist inside. Great with the Chantilly creme, but also, just in the hand with nothing. YUM! Can't wait to try it with some lemon curd and some sort of chocolate topping, too. Thanks! So, I totally saw this on my feed today. We were celebrating my moms birthday today and I looked at the recipe and said, I have everything, it looks easy. Let's do it! It was sooooo good! And the chantilly cream, yum! I added fresh sliced strawberries. My mom told me it was like a cake her sister used to make her before she moved away 27 years ago. Though, hers was from a box and not homemade. Even my hard to please husband loved it. We will definitely make this again. Thank you! Okay, to be clear, 14 Tbsp. of butter is actually 3/4 cup plus 2 Tbsp. Why make things more difficult? There are 4 Tbsp. Per 1/4 cup. I made this cake today, and may I tell you IT'S IN THE TOP FIVE OF CAKES I HAVE EVER MADE. I make Elizabeth David's Chocolate Cake as adapted by Laurie Colwin in More Home Cooking; I make Laura Brody's chocolate torte called Chocolate Decadence in a Williams-Sonoma Chocolate Cookbook; I make my Atlanta Cooknotes' Oliva's Brownies in a 9-inch round cake pan instead of an 8-inch square; and I make Alice Medrich's amazing Almond Cake with a Crunchy Crust from her book Pure Dessert, a top ten book in my library. This vanilla cake is a great addition to the other four; turned out perfect! Maybe better than perfect. I was going to ask if you had weighed the ingredients because I usually don't bake by measures, but it was great the way it is written. The only caveat is you said you don't have to take the butter out early to soften. BUT YOU DO have to melt the butter long enough in advance to cool. Do this step first! Help!! I made this cake and it was a disaster! I followed the recipe to the letter! It turned out like a hockey puck on the bottom 2/3s of the cake. The top 1/3 was delicious as described by other reviewers. I used room temp eggs; beat them with sugar for 5 minutes with a stand mixer. I used cake flour and folded it in by hand. I used unsalted melted butter but had difficulty folding all of it into the batter. It was cooled but still a bit warm. I noticed as the cake baked that it was "swimming in butter". No one has mentioned this....I used 14 tablespoons as directed. Any ideas on what I did incorrectly would be appreciated. I did not use cake flour but used King Arthur All-Purpose Organic Flour. I melted the butter and let it cool. When I added it by hand, after trying to really "fold" it in, I then finally resorted to s-l-o-w-l-y and g-e-n-t-l-y stirring it in until it was COMPLETELY INCORPORATED. I followed the instructions to use parchment paper in the cake pan. I buttered and sugared (organic granulated) a Williams-Sonoma Goldtouch 8-inch Cake Pan, including the parchment paper. My oven is correctly calibrated, and I baked the cake for 30 minutes, removed it to a wire rack, ran a small offset spatula around the edges, turned it onto a flat cake plate after 5 minutes, and set the plate on the wire rack to cool. It did not sink in the middle at all, was beautiful, and tasted even better than it looked. This is definitely worth a repeat in your kitchen. Literally the best vanilla cake I have ever made. Comes out amazing every time. I do use cake flour just to ensure a great light texture. I am going to use this recipe from now for all my vanilla cake bases. Thank you! YAHOO love hearing that people love it as much as I do!! How do you think this cake would hold up as a tall layer in a naked wedding cake? I'm looking for a vanilla cake layer that's sturdy and also shines most in the flavor department since the cake itself will be quite simple. I think it would hold up well! But since it is so moist, id test it to make sure it slices well with multiple layers. It would be perfect for a cake where you need a lot of flavor to shine. Thanks so much for your answer! Simple cakes with maximum flavor are always my favorite! I will be making this cake again and again. The recipe is easy to follow and producing a very moist cake, with the crispy exterior. I did make the Chantilly cream which also came our great with the added flavor of the vanilla bean paste. Thank you, Kristin - very helpful. Cake was divine. I did not have vanilla bean paste, but scraped 1 whole vanilla bean pod instead. Had a great, crispy exterior and moist, sweet interior. Skipped the Chantilly cream out of laziness but sprinkled a little powdered sugar on top before serving. Smart to just scrape the bean! That'll always work nicely in place of paste (basically the same thing, just a bit thicker).